History: The island of Rhodes is located at the crossroads of two major sea routes of the Mediterranean between the Aegean Sea and the coast of the Middle East, as well as Cyprus and Egypt. The meeting point of three continents, it has known many civilizations. 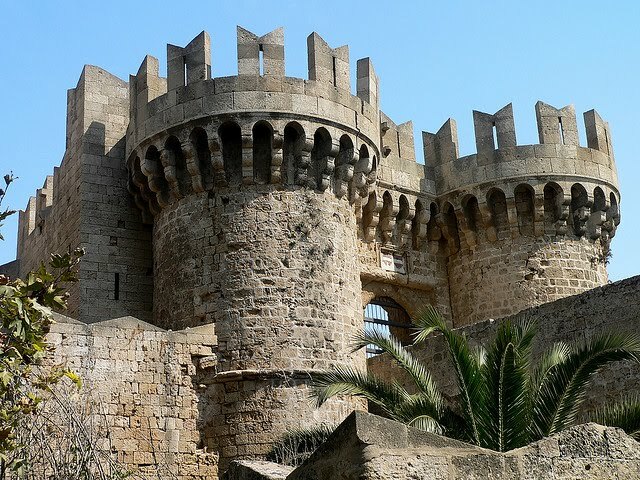 Throughout its long history the different people who settled on Rhodes left their mark in all aspects of the island’s culture: art, language, architecture. Its strategic position brought to the island great wealth and made the city of Rhodes one of the leading cities of the ancient Greek world. The island was inhabited as early as the late Neolithic period (4000 B.C.). In 408 B.C. the three major cities of the island – Ialyssos, Kamiros and Lindos – founded the city of Rhodes. The three centuries that followed were the golden age of Rhodes. Sea trade, skilled shipbuilders,and the careful and open-minded political and diplomatic manoeuvres of the city kept it strong and prosperous until Roman times. Due to lack of written sources we have little information concerning this period. The restoration work of the Italians neglected or even harmed surviving buildings in favour of the Knights period. Having retreated from Jerusalem and then Cyprus, the Order established its Headquarters on Rhodes, taking a leading role in the Eastern Mediterranean at this time. During the Knights’ era the fortifications were extended, modernized and continuously reinforced. Α hospital, a palace and several churches were among the many public buildings constructed at that time, offering interesting examples of Gothic and Renaissance architecture. Ιn spite of the hostilities with the Ottoman Empire, sea trade was a source of wealth and the markets of the city were thriving. Under the Knights, the island had a period of prosperity and the relations between them and the local population was characterized by tolerance and often by close collaboration. Most of the streets of the Medieval Town coincided with those of the ancient city. The division of the town into two parts was retained. in Rhodes the Order kept a well-organized archive that included documents issued by its leadership, correspondence, notary acts, etc. The archive has survived and is found today in the National Library of Malta. It constitutes a valuable source of information for the period. The city was divided into its two parts by an inner wall. The Northern part, known as Chastel, Chateau, Castrum, Castellum or Conventus, was the site of the Grand Master’s Palace, the church of the Knights, the Latin Cathedral, the Catholic Bishop’s residence, the various tongues quarters, the Knights houses, a hospital etc. The South part, known as ville, burgus or burgum was the area where the laymen lived and included the market, synagogues, churches and public and commercial buildings. In 1522 the Ottoman Turks conquered the city after a second long siege. New buildings were constructed: mosques, public baths and mansions for the new patrons. The Greeks were forced to abandon the fortified city and move to new suburbs outside its walls. In the Ottoman era Rhodes lost its international character. The city maintained its main economic function as a market for the agricultural products of the interior of the island and the surrounding small islands. After the establishment of their sovereignty οn the island, the Ottoman Turks repaired the damaged fortifications, converted most of the churches into mosques and transformed the major houses into private mansions or public buildings. This transformation was a long-term process that aimed to adapt the buildings to the Ottoman way of living. The Knights period facades with their sculptured decorations, the arched gates and hewn stone walls were enriched with the random character of the Ottoman architecture adapted to the local climate and culture. Ιn this process most οf the architectural features of the existing buildings were preserved. The most characteristic additions were the baths (usually in the back of the buildings) and the enclosed wooden balconies οn the facades over the narrow streets.In this this way most of the buildings of the Hospitaliers’ period in the Medieval Town were well preserved. The result was a mixture of oriental architecture with imposing western architectural remains and more recent buildings, which were characteristic of the local architecture of the time. Ιn the l9th century the decline of the Ottoman Empire resulted in the general neglect of the town and its buildings, which further deteriorated due to the strong earthquakes that often plague the area. Italian troops took over the island and the rest of the Dodecanese in 1912 and in 1923 Italy established a colony Isole Italiane del Egeo. The Italians demolished the houses that had been built on and beside the walls during the Ottoman era and turned the Jewish and Ottoman cemeteries into a “green zone” surrounding the Medieval Town. They preserved the remains of the Knights period and removed all the Ottoman additions and also reconstructed the Grand Master’s Palace. In addition, they established an Institute for the study of the History and Culture of the region.